When it comes to versatility, the Graco Dream Suite Bassinet – Mason has it mastered. With this bundle, you not only get a cozy and entertaining bassinet but a changing table at the click of a button. Easy to wash fabrics, vibration settings, a canopy, soft toys, and a mattress pad cover are also included in this big bundle. 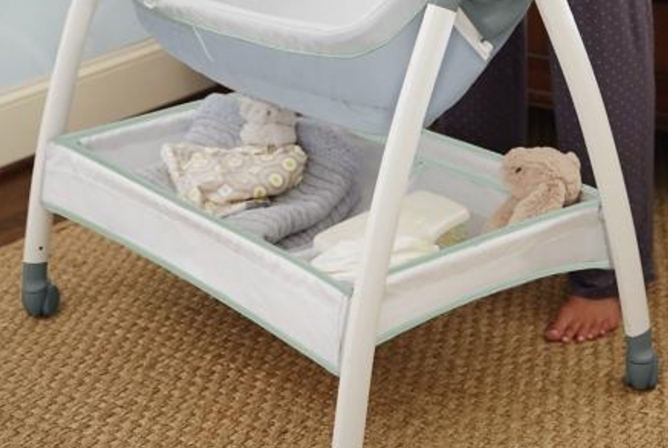 And don’t forget the large storage basket that hangs out beneath the bassinet, perfect for diapers, wipes, burp cloths, and other necessities you might need handy. For added safety, there are also lockable wheels and mesh side panels in the sleeping area. All-in-all, the Graco Dream Suite Bassinet – Mason is a great versatile little bassinet that can provide long use and many different needs for your family. 4 PRICE + LONGEVITY | Reasonable Price For Many Features! The Graco Dream Suite Bassinet – Mason has great versatility with a bassinet and changing table all rolled into one bedside unit. Graco is a top brand that many parents trust to keep their babies safe and entertained. This company always delivers with easy use and practicality in mind, as well as putting out products made for everyday families on a tight budget. Graco is also known for creating structurally sound pieces of gear, but not made with the highest quality materials. The mesh panels on both sides of the bassinet walls provide greater air flow within the sleeping area. Safety for the Graco Dream Suite Bassinet – Mason is very similar to the Chicco Lullago Portable Bassinet that we reviewed. It’s made with standard and average quality materials. For example, the mattress pad and cover are made of polyester with a foam filling. Because there are no claims that fire retardants or other “allowable” chemicals are used, it’s safe to assume that they are applied to this product. Both a plus and a minus are the mesh panels and wheels of the Graco Dream Suite Bassinet – Mason. The mesh panels on both sides of the bassinet walls provide greater air flow within the sleeping area. However, many bassinets today are starting to include 360-degree mesh walls, which are optimal if baby’s face ends up smooshed against the wall of the bassinet. Another safety factor that is a plus and minus for the Dream Suite is the lockable wheels. Wheels on any piece of baby gear need to be made aware of by adults and locked when not in use. A great feature with this bassinet is that they ARE lockable. This prevents any siblings that might want to give your baby a little joy ride. 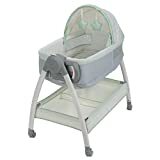 However, this bassinet has the Juvenile Products Manufacturers Association (JPMA) stamp of approval, which is an independent safety organization. This is always a good certification to look for when shopping for baby products, as it shows that the company goes above and beyond and isn’t just scraping by on minimal safety standards. There are a few comfort features that add a nice touch to this bassinet. With two vibration settings, mesh side panels, a canopy, and soft dangling toys, the Graco Dream Suite Bassinet – Mason is sure to keep your baby cozy and entertained. The vibration feature takes batteries (that aren’t included). A canopy is a great thing to have for light blocking and creating a secure environment for baby to rest in. The soft toys are also a nice added touch, helping to keep your baby entertained for at least a few extra seconds. With two vibration settings, mesh side panels, a canopy, and soft dangling toys, the…Dream Suite …is sure to keep your baby cozy and entertained. There are two mesh side panels in the Graco Dream Suite Bassinet – Mason that help increase breathability inside the bassinet. While this is great to have, it’s becoming more common for bassinets to have 360-degree mesh walls. This is to make sure that baby can breathe easily if their face gets stuck against the wall of the bassinet. The other materials on the bassinet walls are still breathable, though, just not as safe as a complete mesh wall would be. On the upside, the walls are a completely closed system, assuring that baby won’t get their cute little limbs stuck in loose or open walls. A lot of features are packed into the Graco Dream Suite Bassinet – Mason, but it still takes up a small footprint. It weighs in around 18 pounds and has a bassinet, changing table, and a storage bin all packed into a reasonable little bassinet that will easily fit at your bedside. The bassinet also weighs around 18 pounds and has lockable wheels for easy transport around the house. The mattress dimensions are 35 inches long by 23 inches wide, making this a great long-term bassinet. The mattress dimensions are 35 inches long by 23 inches wide, making this a great long-term bassinet. New recommendations for babies sleeping in the same room as parents is 6 months, aiming to reduce the risk of SIDS. The only thing that most parents like to do is to buy their own crib sheets for this mattress pad. Even though the Graco Dream Suite Bassinet – Mason comes with its own machine washable mattress cover, some parents like the idea of having organic, or more comfortable, sheets for their baby. The top feature of the Graco Dream Suite Bassinet – Mason is that it is a “Complete Bedside Care Center.” It not only can be used as a bassinet but also converts into a safe changing table with the click of a button and a flip of the table. This is an awesome feature to have in the early days when your little one is constantly needing diaper changes, especially in the middle of the night. In order to use the changing table, there is a small handle and buttons at the foot of the bassinet. Switching from bassinet to changing table is super easy and can be done one-handed. To switch from changing table to bassinet takes two hands. The changing table is a spot clean only surface, and the bassinet mattress cover can be removed and machine washed. An informational user manual is available for more details on the care and instructions of this unique piece of baby gear. Also aiding with endless diaper changes is the storage basket underneath the bassinet. This makes it easy to have diapers, wipes, burp rags, blankets, and extra clothes on hand. For families with kids that might share a room with baby, the storage basket is a plus so that you aren’t sneaking into siblings’ room in the middle of the night for extra supplies. Even though the Graco Dream Suite Bassinet – Mason doesn’t take up a ton of space, this is a bigger and bulkier bassinet. The lockable wheels make it easier to move from room to room, but it might be a little more difficult to transport around the home. Also, this is more of a permanent bassinet that isn’t quickly disassembled for traveling like other bassinets we’ve reviewed, although it is possible in a pinch. PRICE + LONGEVITY | Reasonable Price For Many Features! Longevity for the Graco Dream Suite Bassinet – Mason is a little better than average. The bassinet is recommended for use up to 15 pounds, but the changing table can be safely used for up to 30 pounds. The bassinet and the changing table are the same platform, so it’s safe to say that the bassinet can structurally handle 30 pounds as well. 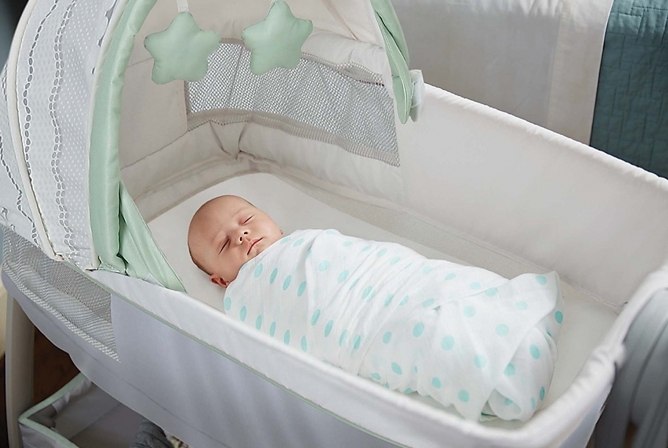 Graco states that the lower bassinet weight limit is due to the fact that this is the time that most babies start becoming mobile and could easily fall out of the crib. That being said, the weight limit can be interpreted as 30 pounds OR when baby starts pushing up on their hands and knees. The bassinet is recommended for use up to 15 pounds, but the changing table can be safely used for up to 30 pounds. Due to the fact that the sleeping area is a little larger than most bassinets, the Graco Dream Suite Bassinet – Mason may be able to be used closer to 6 months. It’s common for many babies to outgrow a more average sized bassinet between 3 to 5 months depending on their size. 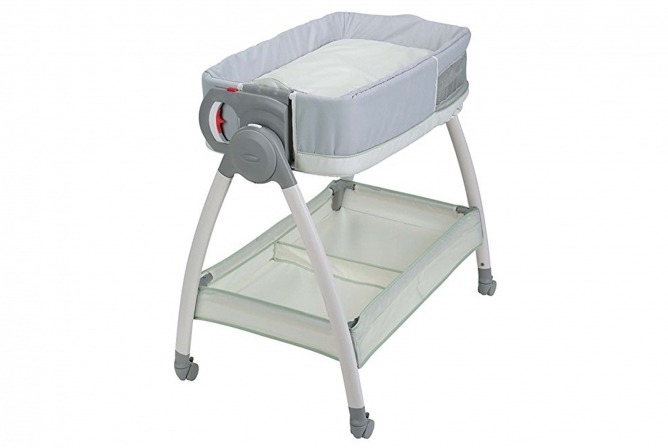 Longevity due to the larger sleeping area, changing table, and overall versatility of this bassinet makes this a winner in the Longevity Category. The price for the Graco Dream Suite Bassinet – Mason is very reasonable if you factor in a number of features you’re getting in return. Let’s sum it up. With this whole package, you are getting a great sized bassinet, changing table, large storage basket, mattress pad cover, vibration settings, a canopy, dangling toys, and lockable wheels for easy maneuverability around the house. That’s quite the package! …you will get a lot for the price with the Graco Dream Suite Bassinet – Mason. Even though the materials aren’t of the strictest safety standards like the BabyBjorn Cradle, you will get a lot for the price with the Graco Dream Suite Bassinet – Mason. It is a structurally sound and very versatile piece of baby gear that will provide for many different needs over a longer period of time compared to its competitors. When it comes to versatility, the Graco Dream Suite Bassinet – Mason has it mastered. With this bundle, you not only get a cozy and entertaining bassinet but a changing table at the click of a button. Easy to wash fabrics, vibration settings, a canopy, soft toys, and a mattress pad cover are also included in this big bundle. And don’t forget the large storage basket that hangs out beneath the bassinet, perfect for diapers, wipes, burp cloths, and other necessities you might need handy. For added safety, there are also lockable wheels and mesh side panels in the sleeping area. The wheels are great for maneuvering the bassinet around the home but are still lockable so siblings don’t decide to give baby a little joy ride. Also, the mesh side panels provide extra air flow within the sleeping area, even though 360-degree mesh walls are preferred in bassinets. All-in-all, the Graco Dream Suite Bassinet – Mason is a great versatile little bassinet that can provide long use and many different needs for your family. Graco is a trusted brand that always aims to deliver practicality and easy use to parents, and they don’t disappoint with the Dream Suite Bassinet.